The staff at KitchenWholesalers.ca are excited to offer new homeowners—and anyone else, the opportunity to install stunning kitchens at affordable prices. After all the expenses involved in purchasing a new home, a quality kitchen can really seem like an impossible dream. KitchenWholesalers.ca wants that to change. With Kitchen Wholesalers, your dream kitchen can become a reality without compromising on quality or design. Browse through our various designs available in different colors and take pleasure in knowing that you will get the quality kitchen at a price you’ll love! Cabinets at KitchenWholesalers.com are always constructed from solid wood. Different to other companies in the industry, we never substitute inferior pressed wood in our products. At Kitchen Wholesalers, you will always get the real thing! Plywood tops, sides bottoms and shelves and Grade ½” plywood. At first glance, you will be impressed with our expert craftsmanship and intricate style. You will be fascinated as you study the elaborate workmanship of our kitchens! Soft-close and full overlay dovetail under mount drawer boxes slide easily on stainless steel drawer glides. Cabinet doors feature European concealed and adjustable hinges. What will really bring a smile to your face will be the inconceivable price tag attached to each of our kitchens. While we spare no effort in designing your kitchen, our goal is to furnish your home with a functional, beautiful kitchen at low cost. We work hard to make you happy. That’s why we offer quick shipping of all your orders, usually within three weeks from the time you place your order. KitchenWholesalers.com brings you quality designed kitchens at great value. 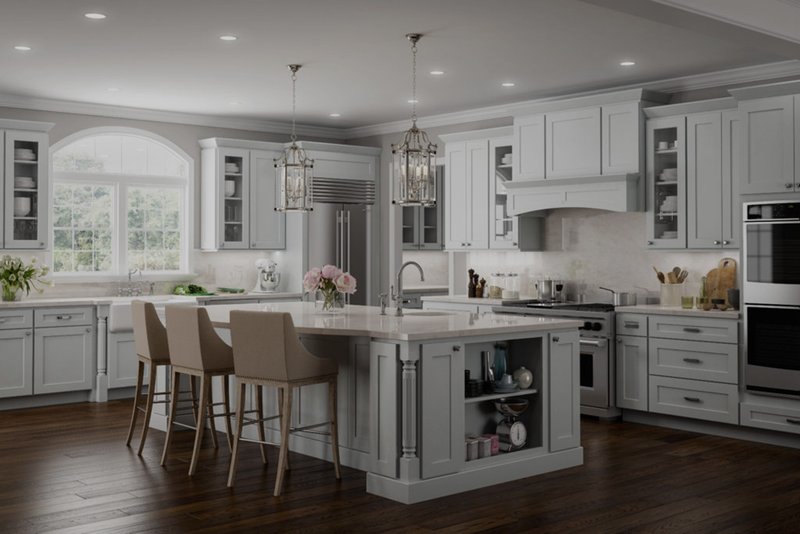 In addition to our breathtaking design and excellent quality, our kitchens are designed—“Ready to Assemble” or you can order “Built up Expertly Assembled”. Opt for Built up Expertly Assembled kitchen—if you want to save time and energy. But if you’re handy and enjoy cabinetmaking, you’ll love the thrill of building your own kitchen! Whether you have questions or need information, our friendly staff is ready to assist you. Your business is important to us and we treat you with the respect and care you deserve! Feel free to forward your inquiries to us or better yet, call us and we’ll be happy to help!